In the following, Shen presents her thoughts, feelings and contextualization on her new work, “Against the Grain”. 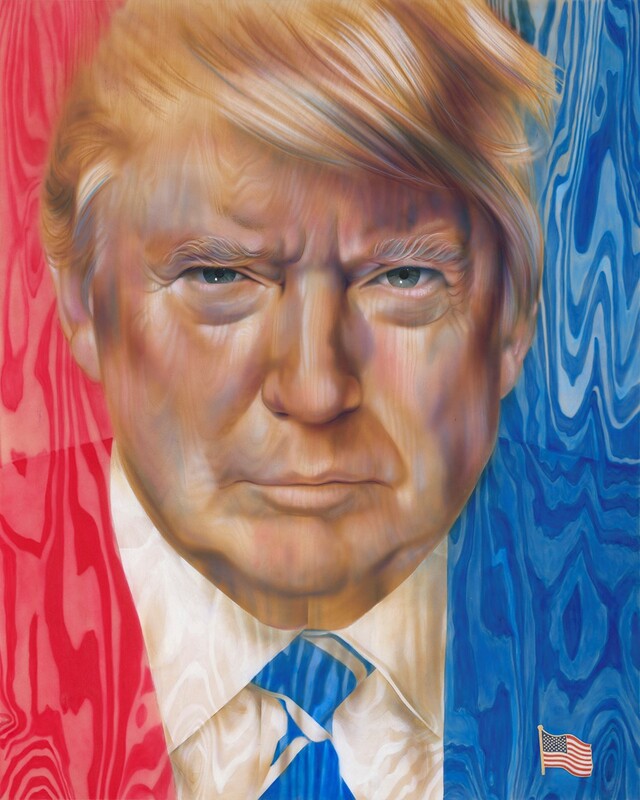 I created this painting of President Trump, entitled “Against The Grain”, using airbrushed acrylic, chalk, and collage on a 60 x 72 inch wood panel. President Trump is my subject because I have a deep abiding respect for the office of the President of the United States. Additionally, I am heartbroken at how divided our great country is. This painting, for me, is not a political statement, nor in any way an effort to bring conflict. My mother often told me when I was teen, deathly afraid of not fitting in, “If they aren’t talking about you, you’re doing something wrong.” It is here that I can relate to President Trump. I was an outcast, and only wanted others to see the good in me. Sadly, for me, my peers only pointed out what they didn’t like about me. The process of making this painting, as well as the ensuing conversations it is evoking, force me to ponder how to identify with others rather than judge them. How did you learn about the Outwin Boochever competition? This past summer, my family and I visited 23 states. While visiting a friend in Baltimore, she mentioned that she knew the director of the National Portrait Gallery. Director Kim Sajet saw my work, told me about the Outwin Boochever, and recommended that I enter the competition. Upon this first visit to the Gallery, I was in awe… absorbing the techniques of these masters of the portrait. I felt immediately at home and deeply inspired. I felt as if I were standing on sacred ground. Are there any special circumstances surrounding the creation of your portrait? I knew I had my work cut out for me when Kim Sajet suggested I enter the Outwin. I was a commercial artist, never having made a social statement in my work before. I was forced to use my skills to paint commissions to live. Art school wasn’t an option for me. I grew up emotionally disadvantaged in a middle class family in San Jose, California. I also was the primary breadwinner in my first marriage. Even in the street art years, I painted butterflies and pretty pictures that people always liked. It wasn’t until I visited a county woman’s center that I realized I had been a victim of abuse much of my life. I realize now that I had been idyllic, never even knowing my own truth, let alone having spoken or painted it. This piece is the first for me in discovering my identity, a woman with her own voice, who is primarily self-taught and is no longer and will never again be a victim of abuse.